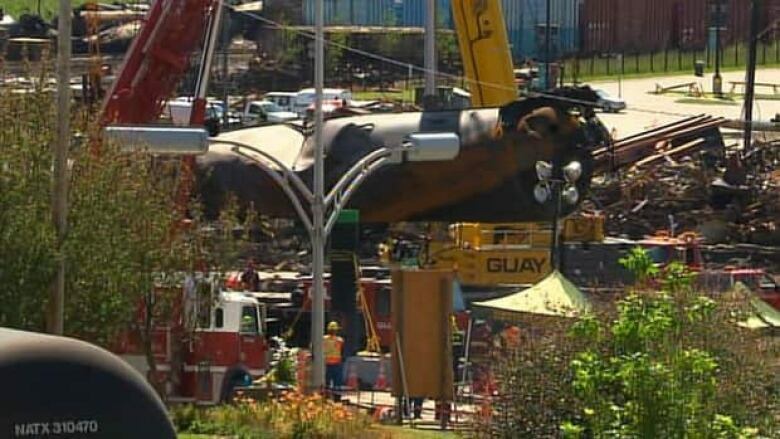 Recovery work in Lac-Mégantic has resumed after taking a day off to wait for specialized equipment coming in from Montreal. Recovery work in Lac-Mégantic resumed early Sunday morning after taking a day off to wait for specialized equipment coming in from Montreal. 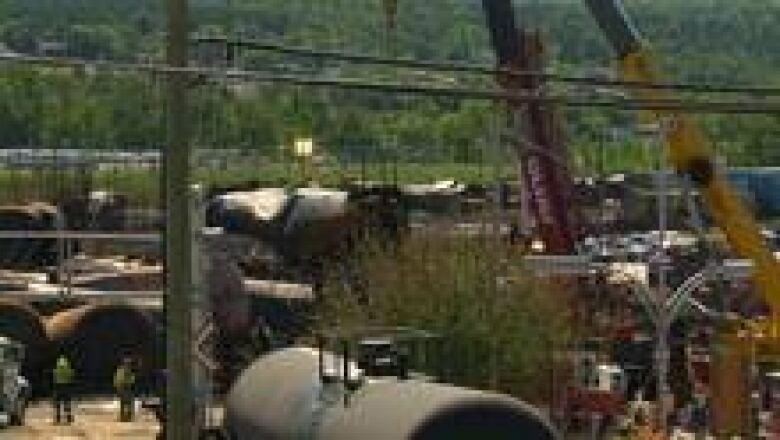 Three cranes are now on site in the red zone in Lac-Mégantic, lifting tankers that, in some cases, still contain oil products. Sgt. Benoit Richard of the Sûreté du Québec said the tankers can’t be pushed or dragged because of the presence of oil, and also to preserve the possible bodies underneath them. On Sunday afternoon, mayor Colette Roy-Laroche and members of provincial civil security announced that evacuees of about 180 homes would be able to enter their houses and apartments this week to collect some personal belongings, such as medicines. Firefighters and other workers will also visit some homes to check refrigerators and deep freezers for rotting food that could be releasing micro-organisms hazardous to people`s health. So far, the remains of 42 of the 47 people presumed to have perished in the July 6 train explosion have been found. Twenty-two of the 42 bodies found have been formally identified at this point in time, though only 19 of the names have been publicly released. Those confirmed dead are Diane Bizier, 46; Guy Bolduc, 43; Stéphane Bolduc, 37; Yannick Bouchard, 36; Yves Boulet, 51; Frédéric Boutin, 19; Karine Champagne, 36; Kathy Clusiault, 24; Maxime Dubois, 27; David Lacroix-Beaudoin, 27; Gaétan Lafontaine, 33; Karine Lafontaine, 35; Jo-Annie Lapointe, 20; Roger Paquet, 61; Éliane Parenteau, 93; Mélissa Roy, 29; Andrée-Anne Sévigny, 26; Élodie Turcotte, 18; Joanie Turmel, 29. The SQ said it believes the remaining five people may be in locations they were previously unable to search. The specialized equipment, including a particular crane, will help move oil tankers and rubble so crews can search in strategic locations. A crew of Montreal firefighters was also deployed and are expected to work in Lac-Mégantic for the next three weeks.